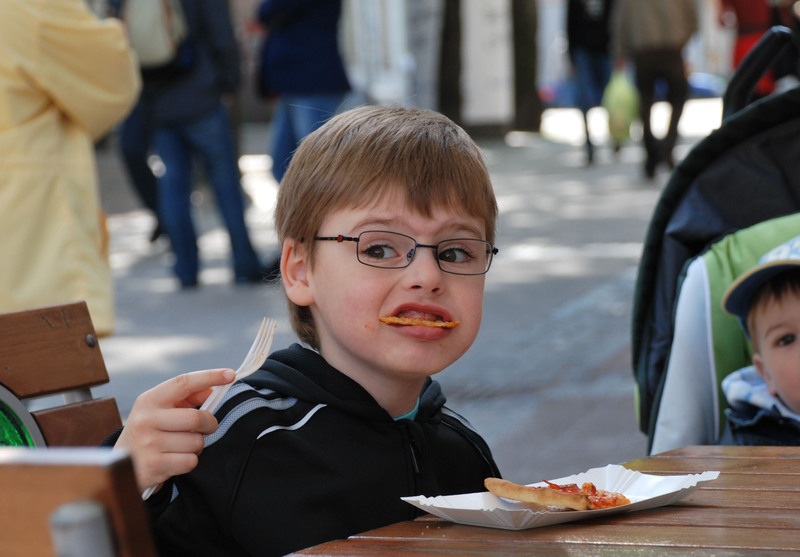 A young boy watches as people walk by while enjoying his lunch at a pizza shop outdoors in Sopot. As I board on the plane and leave for Sopot, Poland, I was excited and scared. Excited, because I was about to spend a month in Europe. Scared, because I had no experience in Polish nor the culture in Poland. I arrived in Sopot, seven hours later than planned. Through pure luck, I managed to find my ride to the hotel that I was staying. I walked about the streets to get to Spatif – a bar, for a opening party of a photo exhibition. I took the route near the Baltic Sea, it was quiet, left for some joggers who enjoyed the cool evening breeze. The streets of Sopot were lively. Filled with people walking their dogs, young people out early for a drink or two, locals finishing up their meals at the outdoor patios, and people enjoying their cigarettes while striking up conversation with another stranger. As the week went on, I spent more time exploring the cafes and grocery stores. Each cafe is unique in its own way. Tucked in one corner of the street was a rather modern cafe, with natural light coming in from the huge windows. A lively and what seems to me to be pop music, played in the background. Espresso is different in Europe. I got a tiny cup of espresso with a thick layer of foam on top of it. That, was true Espresso. With it, came a piece of chocolate and a glass of water. I observed the locals sitting next to me for a bit, and like a little child, I followed what they did. I drank my Espresso and then I ate my piece of chocolate. I was introduced to this cozy, warm-looking cafe hidden in a little valley near the Post Office. It wasn’t obvious to me that it was a cafe. There wasn’t any sign of it being a cafe. I headed in and was delightfully surprised by this little cafe. It was dark, with minimal lighting in one part of the cafe. The furniture in the cafe seems to me to be a mismatched collection. Hidden in one corder was two different colored sofas and mismatching pillows. My friends and I ventured into the other half of the cafe. We sat near the huge window. I was truly enjoying the artsy atmosphere in Gdańsk. Every turn I took I would hear live music coming from street performers. Everywhere I looked, I could find either a modern looking cafe, or an old cafe stuffed with vintage furnitures, bookshelves, and mismatching coffee cups. With the little Polish that I know, I managed to get smiles from the waitresses or cashiers. People were friendly. And even though I felt like I was the only Asian in town, I felt at home immediately. View gallery of Poland here. Interesting article – good find something interesting on the subject. I subscribe to.